Truth be told, I’m even more impressed with the people behind the product than the product itself. Both @LeoWid and @joelg87 are amazing people. They are on a consistent look out for ideas, listening to what each and every user has to say about BufferApp to improve its usability. Crowd sourcing – that is what they are doing. And they are doing it right! This also reminds me that many projects / products fail because someone tried to pack too much into it at one go – resulting in an overly complicated product or an extended timeline to which sometimes lead to no ending. What they did is to launch a simple and lightweight product that works, THEN rollout updates that caters to the users. What do they get out of it? They save time, and they can get the functions right. What do we get out of it? A product that we love! The worst thing that can happen is to drop someone a DM or @mention and you get a reply days after (or never!). As for BufferApp, you can be assured that they will respond to you – whether it is a simple ‘hello’, a complain or a complement, you can expect a reply. Don’t believe me? Put them to the test and experience for yourself! Simple as it sounds, the above is really the essence of being social and businesses should realize that social networks are not a place to rack up the fan / follower count and blast them with sales pitches. You simply tell Buffer your schedule... once! Okay, enough about the great people behind the product – now the product itself. I started using this nifty tool a few weeks back and what really caught my attention is the ability to automatically schedule tweets periodically but yet have so much control over the tweets. 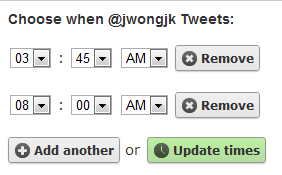 What I really meant is that you do not need to schedule every individual tweet manually anymore, unlike TweetDeck, HootSuite or etc. What makes Buffer different is that it also comes with optional add-ons (or goodies): a Google Chrome, Safari or Firefox browser extension. You can opt to “Tweet Now” where you share the content immediately or “Add to Buffer” where the content will be added to your queue of updates on Buffer. Did I also not mention the “Shorten Links” feature? These 3 are perhaps the most sought after functions when it comes to sharing a Tweet (at least for me). Buffer did not forget about the mobile users, too! Instead of developing an individual mobile application to suit all existing smart phones, they took a step forward (or backward) to come up with a very simplistic yet smart way of making Buffer happen for a larger population – through email. Yes, all you need to do is to share your content via email on your mobile and send it to: add@to.bufferapp.com where the subject is your tweet, and the body is your link - and it will automatically be added unto your Buffer queue. Tweet Suggestions - plenty of them! 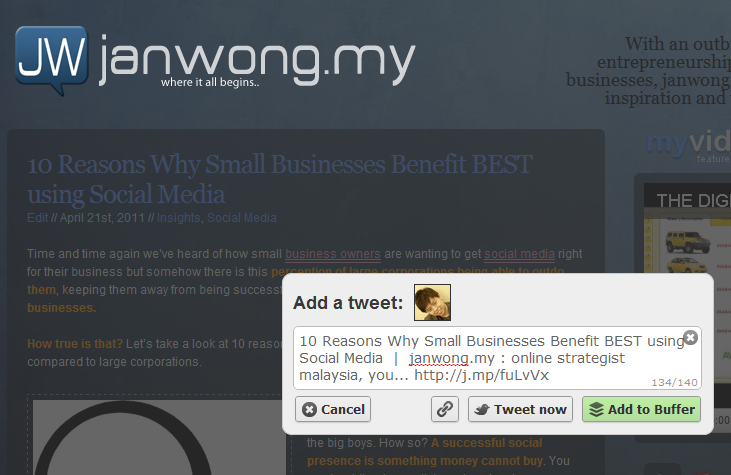 Now comes my all-time favorite function – “Suggest me a Tweet” where Buffer generates a random tweet for you! I spend quite a bit of time looking through all the tweets at times just to see what will I get. Quotes by the famous, articles by bloggers and even jokes – you can get them all in a click. I find it really fascinating to see how Leo and Joel is able to roll out updates almost every single week at such a rapid pace – something many projects (especially startups) aren’t able to do. Their dedication says it all and they are making it happen beyond a great social product – but being social themselves. If you’re interested in looking up what are all the other functions of Buffer (analytics, bit.ly integration, button for blogs and more), click here to see a full list of them (and be prepared for more to come)! Don’t believe what I have to say about Buffer? See what others have to say over here! important note: this article is not by any chance a paid review, advertorial or request by anyone representing BufferApp and / or its founders and it is solely written on my experience with @LeoWid and @BufferApp itself. Wow, Jan, thanks a lot for the thorough reivew. It is really appreciated! And thanks for the kind words about me and Joel. You are absolutely right, it is a win win for both sides if we listen as we only build what people actually want and it also saves us a ton of time! Thanks again for going into such detail for your readers and I think there are some great tips here that I have never considered myself even to be honest. Especially that this is actually the essence of all Social Media, I couldn’t agree more, that is great wording. Ok Jan, let me Buffer this Jan – twice! p.s. do keep me updated on all the happenings on Buffer! i don’t wanna miss them. Let me know if I can ever help out with any questions you have.